January 2011 – on my way: make it someday. … and I’m in love. I’m also exhausted. We don’t do three races in three days very often, and let me tell you, it really wears you out. I’m pretty much toast. This weekend a couple of us went up to Orford, Quebec for a NorAm mini-tour and it was tons of fun. If you’re not familiar with the concept of a mini-tour, think of it as kind of like a three-day stage race in biking. The difference is that on the last day, everyone starts in a pursuit format with the time gaps based on your times from the first two races, and the first skier to the finish line wins the whole weekend. NorAms are the Canadian equivalent of SuperTours; they are the highest level of racing in the country. So these races were guaranteed to be good. I was particularly excited for the pursuit because I haven’t done a mass start all year (well, I did the one at the Eastern Cup, but I dropped out after 2k, so that doesn’t really count does it?) and I was really psyched for some head-to-head competition. I used to love mass starts. Now I almost never get to compete in them. It was just Ollie, Tim, Matt, Alex and I, and then Ollie got sick and couldn’t join us on Saturday and Sunday, which was a bummer. We were flying solo without Pepa or any sort of wax support, but it worked out totally fine and we all had good skis – even though the boys and I put completely different things on our skis for both of the classic races! On Friday, I went on Swix and they went on Rode. Then on Saturday, I went on Rode and they went on SkiGo. On both days, I raced first and I was done waxing my race skis before most of them had even started testing – Tim was nice and talked to me about the wax on Saturday, which was a bonus. Even if you know what you think, it’s nice to bounce it off someone so you have a little more confidence in what you’re doing. Anyway, I realized that I am grown-up enough to go to a race and do all of the testing and prep work on my own without getting too stressed out or running out of time to warm up, which is cool (more on that later). Friday and Saturday went okay for me – I was tenth both days, and felt like I skied pretty well on Saturday in particular. But I feel like I’ve kind of been in a rut lately; it took me a long time to get back into racing shape after being sick for a while in December, and while I have been very consistent all season, it’s been consistently mediocre! That isn’t really our goal around here so I’ve been hoping to have a good race that broke the cycle. On Sunday, I had that race. For the women, it was a 15k pursuit, consisting of three loops on a fast but difficult 5k course. There was a kind of flat rolling section between 0.5k and 1.5k, and then a loooooong multi-pitch climb for about a kilometer, followed by some shorter hills and more rolling terrain back through the lap. 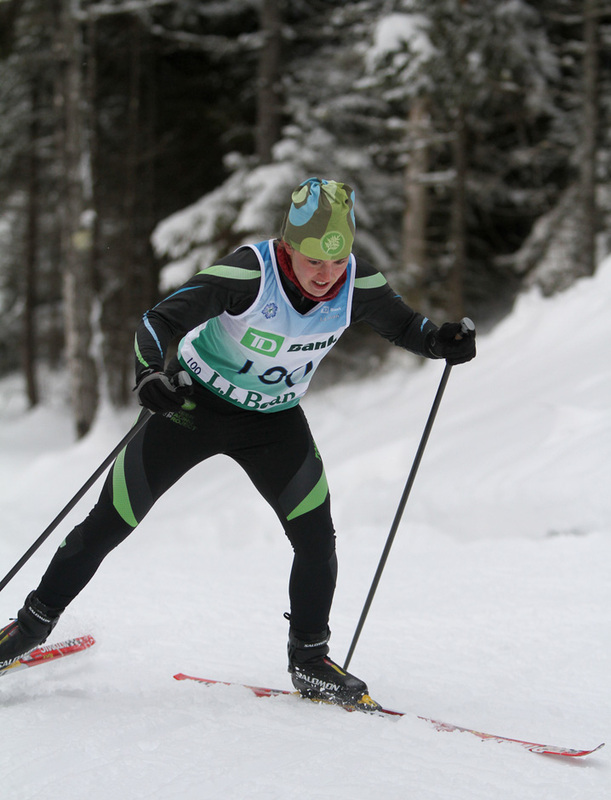 I started in bib 9, six seconds behind Sheila Kealey from XC Ottawa and ten and fifteen seconds ahead of two other skiers. Part of the beauty of racing in Canada is that you really know nothing about most of the people you are competing against, so you have to kind of just ski your race and see how it all shakes out. Anyway, I started off thinking I could catch Sheila; part of the reason I thought this was that she’s only five years younger than my mother. So I took off pretty hard, trying to bridge the gap so I could have someone to ski with. This turned out to be completely misguided. I never caught her and after a few kilometers of maintaining the gap, she simply skied away from me. It turns out that Sheila is a fast lady- she had the 5th-fastest time on the day! Wow. At this point, I panicked for a second. I was sure that I was being dropped because I’d gone out too fast, not because she was speeding up. But then I realized that the pack behind me, which had grown to three or four women, was always ten or fifteen seconds behind me and not gaining ground. So I couldn’t be slowing down that much. By the time I got to the third lap, I was sure I was dying and was about to be enveloped by the pack chasing after me. 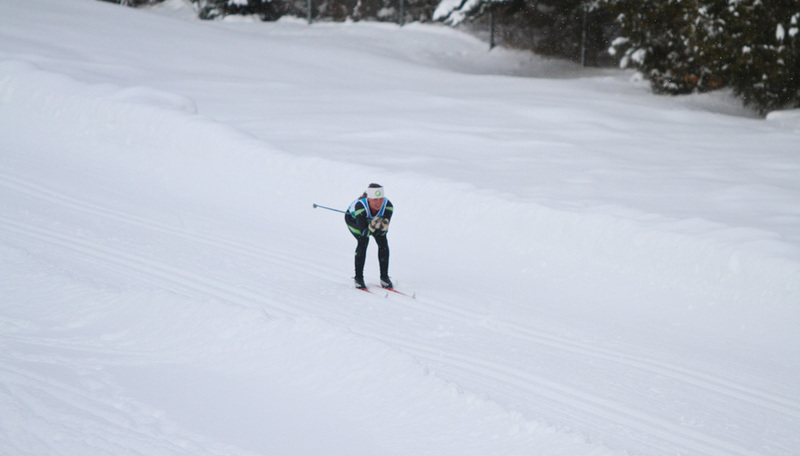 That first kilometer and a half of rolling stuff was the toughest part of the course for me; I skied it pretty poorly. But when we got to the long climb, I gave it everything I had. Megan McTavish of XC Ottawa was in the chase group and must have done the same thing, because the next time I looked back it had shattered. She was still behind me but the other women had disappeared. I now had two tasks to focus on: one, staying somehow in front of Megan, and two, trying to catch bib 3, Michelle Workun-Hill, who was clearly having a tough race and who I could see up ahead despite the fact that she had started almost two minutes in front of me. I went for it. I really, really went for it. And Megan didn’t catch me, not even close. I didn’t catch Michelle, either, but as I crossed the finish line I was mostly just relieved to be ahead of Megan. Anyway, if you’re even still reading this long drawn-out race report, here’s the takeaway message: this was the best skate race I have ever had. I felt great. It was the perfect skate course for me, with manageable climbs that I could really attack. It was so fun to feel like I was going for it after a couple weeks of races where I was definitely not on the offensive as much as you should be. I love racing again. And at the end of the day, I decided that I want to be as fast as Sheila Kealy when I “grow up.” So it’s a good thing that I felt like I was fairly competent at waxing my own skis and all that good stuff…. I have a lot of racing ahead of me! What To Do With Too Much Bread. I made this bread pudding almost a month ago now. It was tasty then, but I was in the midst of a cooking spree and didn’t have time to write about it. What made me remember it now? Last night I went out to dinner at The Bee’s Knees in Morrisville, which is much classier than its website might suggest. In fact it is an extremely nice, really cool restaurant. We ate a couple different things which were all delicious, but one thing – wow! It was a baked pear, topped with local brie melted into a gooey puddle of goodness, drenched in warm maple syrup, and served with excellent crusty bread. How could four ingredients make something so amazing? And why had nobody thought of this combination before? We ate the pear as an appetizer, but afterwards we didn’t need dessert. It was, well, incredible (so was the fish special, but that’s another story). That pear has very little in common with my bread pudding, but what I thought was, simplicity. Sometimes you need to choose a few very good ingredients instead of a lot of very good ingredients. I remember a frittata which I used to make. Originally, it was a mushroom-leek frittata. I thought, this is really good; more must be better. So I started adding more and more of my favorite vegetables. But it didn’t get any better. It didn’t get worse, exactly, but the mushrooms and leeks were enough to make that dish sparkle. 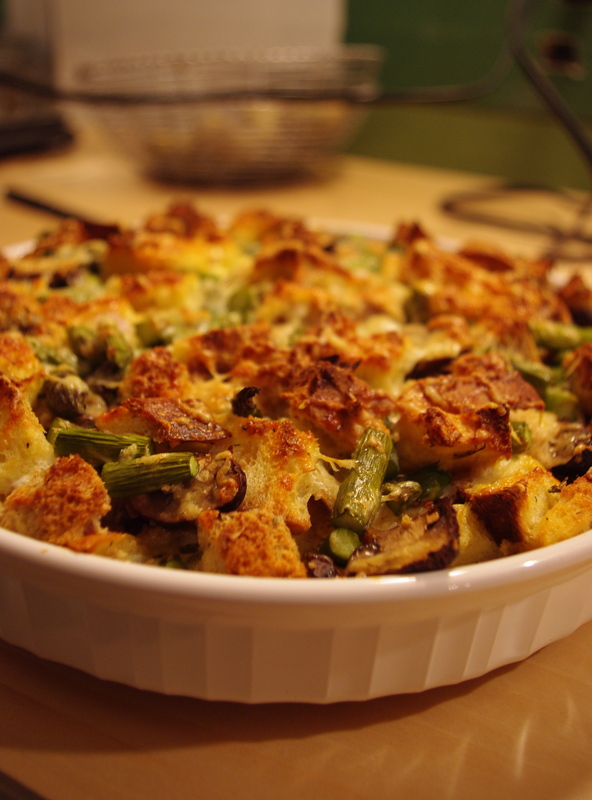 I thought that this asparagus bread pudding was something like that. 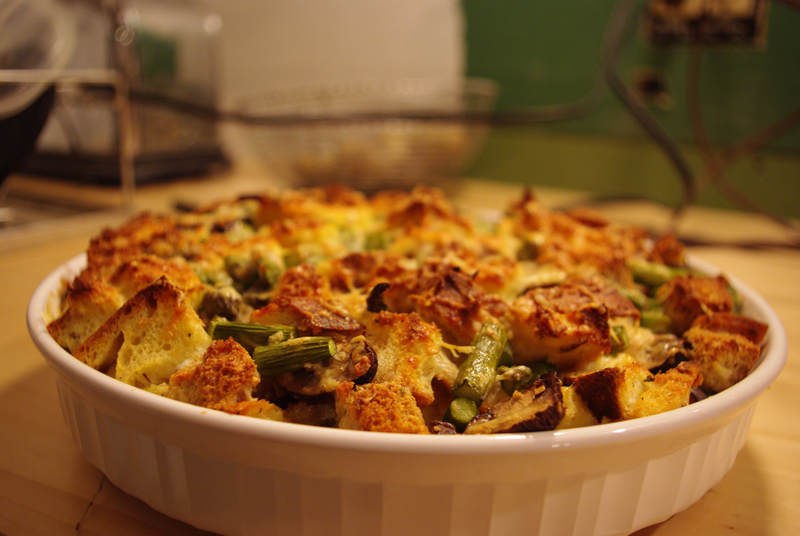 The asparagus is enough to make a fantastic bread pudding. But the more I thought about it, I realized that even though this is easy to whip up, it’s not actually that simple. There’s the bread. The asparagus. A shallot and some mushrooms. Cheese. Eggs and milk to hold everything together. Not too complex, but compared to the pear, it’s far from simplicity personified (or dish-i-fied). It’s a great bread pudding, though. And you don’t often think about bread pudding; or at least, I don’t. But you should – it’s an excellent half of a meal. Think about it. Make this one. You won’t regret it. Preheat the oven to 400 degrees and prepare grease tart dish, or some other baking vessel, to cook the pudding. Then start chopping up bread. Cut all the slices into 3/4 inch cubes, although varying the size a little bit makes things more interesting. Put all of the bread in a large bowl and mix it up so the white and multigrain cubes are evenly distributed. In a separate bowl, mix together the milk, eggs, and seasonings. Pour it over the bread and stir so everything is evenly coated. Finally, chop the asparagus into small (1-inch?) pieces, chop up the mushrooms, and slice the shallots. Toss all of these things in with the bread, and the pour the entire thing into the tart pan. Stick in the oven. Bake for 30 minutes, then take it out and sprinkle the cheese over the top. Return to the oven for 15 or so more minutes, or until it’s quite brown and crispy-looking. I haven’t been cooking much recently. Or: I haven’t been cooking much interesting food. We’ve been traveling nonstop to races – a week and a half in Rumford, Maine, almost immediately followed by three days in Lake Placid – and cooking on ski trips is rarely exciting. It’s a lot of pasta, stir fry, and other basics which are tasty but uninspired. Luckily, when I was home for the holidays I had enough culinary adventures to satisfy me during this boring interlude. I wrote about Christmas dinner, but I neglected to mention that I made a giant, very fancy cake for dessert that night. I think the cake might have taken about as much energy as the entire rest of the dinner, as well as approximately the same number of special ingredients, so it deserves its own post as well. I’d had my eye on a particularly spectacular cake since April, I kid you not. I had dreamed about this cake for months, but never even thought about making it. For one thing, it is a huge cake. I only make layer cakes for birthdays, and this one never seemed right. Secondly, I never had any hazelnuts. Those are expensive little suckers. But on Christmas, I had to pick something for dessert. We traditionally have pie, but since I was completely abandoning tradition with regards to dinner, I figured I might as well make something completely wild for dessert as well. 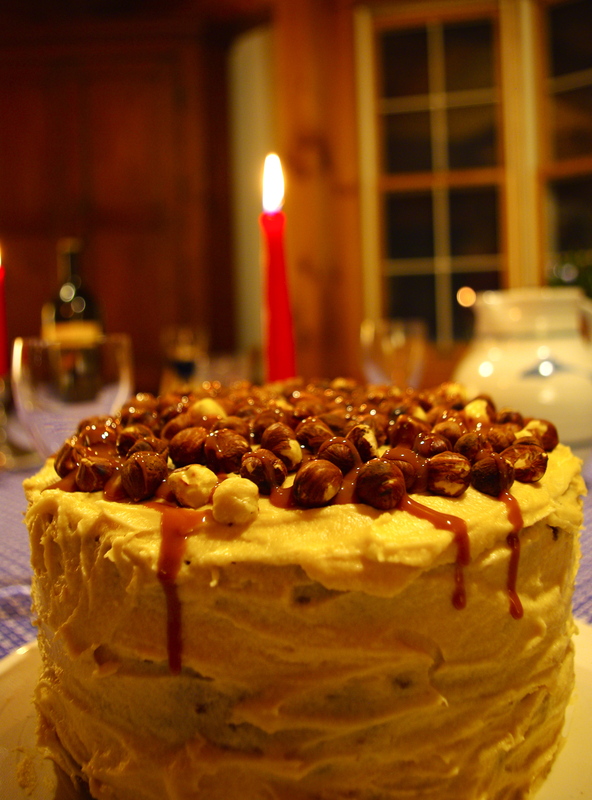 And so: triple caramel cake, a recipe from Melanger, one of the food blogs that inspires me quite often. If you look at the photos of the cake, you’ll see immediately why I wanted to make it. It’s beautiful! Also, I love caramel. And hazelnuts. It seemed like a classy cake. A winter cake. I went for it. I made the cake layers themselves early on Christmas morning, even though I was exhausted and could barely function in the kitchen. Still, I knew that the rest day would be hectic – I had to make a roast and a dinner for five people! – so I managed to whip up some cake. The one problem with the layers was that they sunk a bit in the middle. This is a problem I’ve had in the past with cakes with a dense crumb, and I’m not sure how to solve it. Luckily, with a layer cake, you can just fill the dents with more frosting, so it isn’t a huge problem. Frosting can cover up any number of blemishes…. Once I was over at my grandfather’s house and the dinner was in the oven cooking its merry way along, I tackled the buttercream. It isn’t a true buttercream, but luckily for me, it is modeled after an American buttercream, and doesn’t have any egg in it. The one time I tried to make a real French buttercream, it didn’t go very well. But this frosting was a cinch to whip up. Instead of mascarpone, I used quark. Quark, a soft European fresh cheese, is one of my new obsessions. The Vermont Butter and Cheese Company makes a good version. So: buttercream complete, I started assembling the cake, which meant trimming up the cake layers first. I got to sample some of the cake trimmings and confirm that the cake was in fact delicious. Then I frosted the cake, much less elegantly than Julia over at Melanger did, partly because I wanted to actually use up the buttercream. The last step was to make the top look fancy. I started making the praline and…. it was a terrible disaster. I won’t elaborate. But it ended with me boiling some water in a pan and hoping that my grandfather wouldn’t walk in and ask me what I was doing. I pressed the hazelnuts into the frosting, minus their praline, and then drizzled on some store-bought Vanilla Bean Caramel from Fat Toad Farm, a goat creamery in Brookfield, Vermont. Highly recommended for putting on top of ice cream, in baked goods, or just for eating. I’m jealous that my grandfather got to keep the rest of the jar. So: the finished product was revealed after dinner, and we all ate slices which were much too big. It’s a big cake. It’s a rich cake. It’s a delicious cake. Definitely worth the time and effort, although I can’t say that I will make it again unless another fancy occasion pops up. Did it live up to my expectations? Not quite. But my expectations were pretty high. And part of the reason it wasn’t as good as I was hoping was because it didn’t look as nice as the one Julia made. But we can’t always be perfect. I am an amateur home baker, after all. Thanks, Julia, for inspiring me, as always. 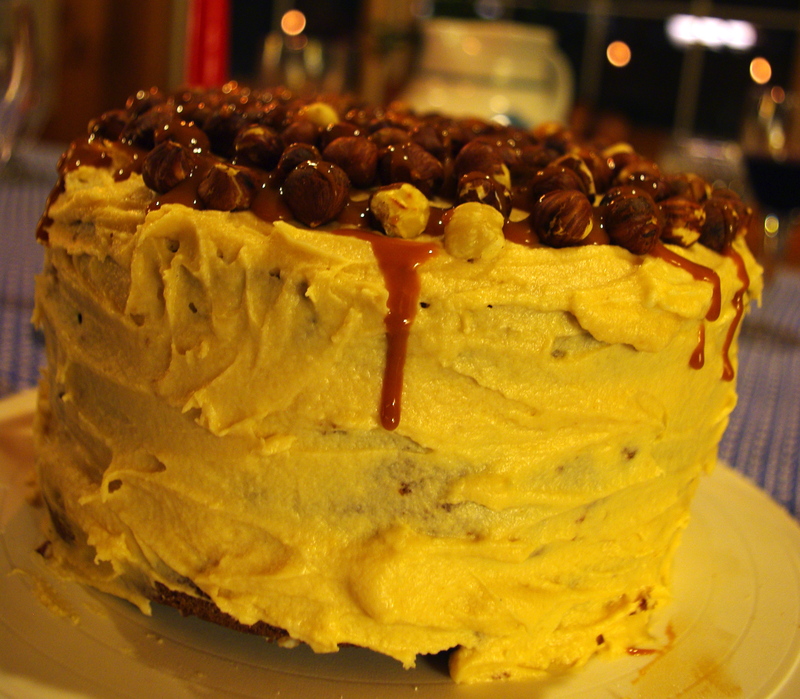 recipe adapted: from Trish Deseine’s Caramel via Melanger. This is a really, really basic cake. Preheat the oven to 350 degrees F and mix all the ingredients together in a bowl. Then pour them into two largeish round cake pans lined with parchment paper. Bake the cakes for 30-40 minutes. Let them cool 5 or 10 minutes, then turn them out onto cooling racks. That’s it. Cream the butter and powdered sugar together in a bowl until it is smooth and no longer lumpy. Add the caramel sauce and the quark and continue beating until smooth. The buttercream should be sweet but slightly tangy as well from the quark. Sample it to see if you want to add more caramel to give it a stronger flavor. Trim the cake layers so that they are flat on top, not domed, if necessary. Then, cut one of the layers in half. Put one of the half-layers on your cake stand or platter, and plop some frosting on top of it. Then put your full layer on top of that. Then frosting. Then the last half-layer, crumb-side down. Frost around the outside and add an extra thick layer on top. Press the toasted hazelnuts slightly into the frosting on top of the cake, just so they stay put. Drizzle caramel sauce over the whole thing; I think it looks nice to have some drips headed down the side of the cake, but others might think that’s just sloppy. I’m going to tell some stories, but before I do that, two notes. First of all: there is a cake in this blog’s future. Just staying, stick around for cake. Secondly, my boss over at FasterSkier, Topher Sabot, took some great pictures at the SuperTours in Lake Placid this weekend. Mostly he took pictures of the men and women who were going really fast and winning and all that good stuff, because that’s what belongs on FasterSkier. He also got a few pictures of me, which he was kind enough to share. I’ll post a couple of them today and a couple maybe later this week. Thanks so much, Topher; best editor ever. Dear reader, if you think it’s cool that Topher gave me photos, go to Cricket Creek Farm – his other business – and buy some cheese. They ship. My colleague Nat says that Maggie’s Round is the best. But anyway: I wanted to write a little bit about Lake Placid. Not even just about Lake Placid this weekend, but about Lake Placid in general. Placid is a pretty cool place. In a lot of ways it represents the past: the city hosted the 1932 and 1980 winter Olympics. Most of the motels are pretty old-school, from the paint jobs and signs down to the appliances inside them. The Olympic Training Center and the ski jumps are hulking, blocky, and grim. But one of the cool things about Placid is that it really, really loves sports. The area has produced at least one winter Olympian for every Games since 1924, and they’re still doing it: in Vancouver, there were eight Lake Placid natives and four athletes from the surrounding towns. And several of them won medals. This town doesn’t joke around. So in that way, Lake Placid also represents the future. I’ve been visiting Placid since I was quite small, when my family would pile in the car over New Years and drive over, almost always through a snowstorm, to watch my aunt compete in the World Cup moguls competitions. We’d stand on the side of the course on Whiteface Mountain, which was windy and freezing cold, and cheer her on. Then she’d have me stand on the tails of her skis and ski me down to the lodge and we’d drink hot chocolate. One year we stayed in Elizabethtown (which I thought was really cool, because my aunt’s name is Elizabeth; my eight-year-old self was sure that was why we were staying where we were) and my parents took us out to an Indian restaurant for dinner. They ordered all the entrees by saying their Indian names, and tried to trick me into eating Baingan Bartha, an eggplant dish. I hated, I mean hated, eggplant. As soon as I had one bite I could tell it was eggplant and got very very mad in an eight-year-old sort of way. That’s my biggest memory of the trip that year. I’m pretty sure the waiter laughed at me. When I was in high school, my aunt was no longer competing in moguls, but she was coaching the U.S. Ski Team. They still had those World Cups during the first week of January, which coincided with final exams my junior year. I scheduled all my exams for one day (which my friends considered suicide) and then went to Lake Placid with Lizzy. She hated living in the Olympic Training Center, so I was her excuse to get a room in a dingy motel in town. We bought oatmeal and brown sugar (the IGA only had granulated brown sugar, I remember this quite clearly, and there was dust on the shelves) and ate it in the motel room before she’d go off to coach and I’d go ski at Mount Van Hoevenberg. I felt pretty special on that trip. Lizzy taught me how to drive in a rental van loaded down with all of the U.S. Ski Team’s ski bags, and we did donuts in an empty parking lot where I couldn’t hit anything because she said it was important not to freak out when you weren’t in control. She introduced me to all of her athletes, and Toby Dawson said hi to me, which made my day (week? month? thanks Toby!). And she took video of me skiing and analyzed it with DartFish, which at the time was super-secret technology. We drew the blinds on the windows of the hotel room so that the Canadians wouldn’t see what we were doing. She was very worried about other teams figuring out what their computer program was. Or maybe she was just humoring me, who knows. In college, I raced in Lake Placid twice. The first time was my freshman year, and it was my very first college carnival. There wasn’t much snow so the races were moved to the ski jumping complex, a two-kilometer loop which goes straight up a huge hill and then straight down it. I think I was so out of my element that I skied quite well out of surprise more than anything – I skied the first lap with Anja Jokela, who raced NCAA Championships for UVM that year, before dying pretty hard. Still, in that first college race of my career, I finished 35th, which isn’t bad by a long shot. I was less than a minute behind Dartmouth’s last varsity skier. It still amazes me that I did that – it was definitely my best race that whole season and I didn’t even realize it because I was in a sea of new skiers. The second time, my junior year, I was a complete different athlete. I had had a breakthrough the year before and had raised expectations for myself. In a 5k skate race on the biathlon trails, I felt fast and went slow. For some reason, I didn’t even race the next day. I can’t remember why. When I came to Lake Placid this weekend for the SuperTours, the specter of that race was hanging over me. So I didn’t. I just raced.